Today we’re introducing a new feature on the blog. Write to us at everyfoodfits [at] gmail [dot] com with a nutrition question, and we’ll debunk or verify it here on the blog. We know that you’ve “heard” that THIS food will help you lose weight if you eat it three times each day for 30 days or THAT food will cause your baby to grow a third eye out of her forehead if you eat too much of it during pregnancy. We’d like to help put those myths to rest, at least among our readership. In all the myths we’ve heard about, or been asked about, this one was nowhere near the top of the list, and we thought worthy of a response based on its uniqueness. To that end, it was worth doing some research to examine any potential validity to this claim. Unfortunately none was found. If you have come across some solid, trustworthy information in support of this notion, by all means let us know. Perhaps pineapple juice isn’t a way to absorb less fat, but it is a way to enjoy some tropical sweetness and a good dose of Vitamin C. This sweet fruit is also a good source of manganese, fiber, and thiamin (Vitamin B1). Fortunately finding pineapple year round is relatively easy since most grocery stores carry cored slices in the produce section, or larger brand fruit cups (Del Monte, etc.). In general, any fruit cups (whether refrigerated or shelf stable) of pineapple are likely to be in juice, without any added sweeteners. In comparison to other types of fruit cups that are often found in light or heavy syrup, nutritionally speaking, this adds to the pineapple’s refreshment. How Stacey Got the Shot: ISO 200, 35mm focal length, f/4.5, 1/40 second exposure. Thanks for answering! I definitely won’t be downing pineapple juice before meals just for the sake of absorbing less fat. I do like the extra vitamin C though. 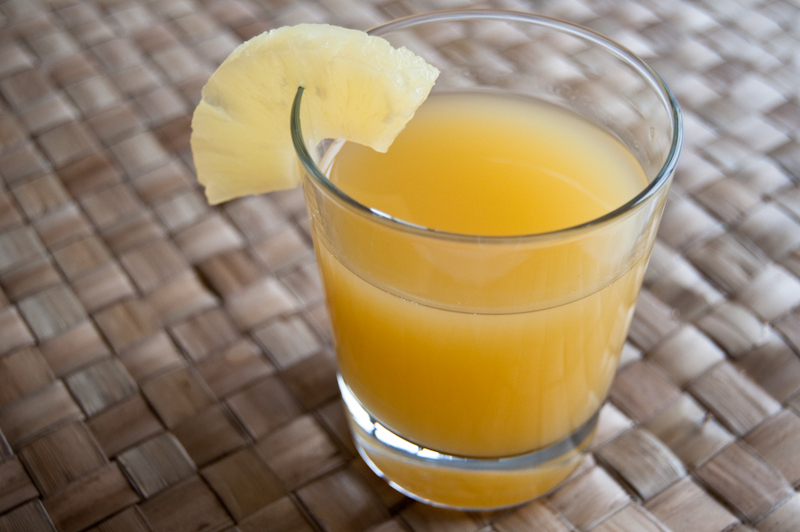 I’ve never heard before that pineapple juice helps your body absorb less fat, but I’ve heard that a glass of juice can lower cholesterol. And I’ve heard it from people who systematically drink pineapple juice and have seen their cholesterol been reduced. Could it also be myth? Stella – Good question! We’ll check it out and get back to you. Interesting question. I’d never heard this of pineapple juice either, but I *did* read it once of milk. Or more specifically, I believe the article mentioned that the calcium in milk helps hinder calorie absorption. I only just remembered now and haven’t researched it any further. Stella – The juice and cholesterol connection is not totally clear. We get more fiber from whole fruit, and we know fiber is beneficial in lowering cholesterol. There are special juicers that allow you to dump in all sorts of foods, and you are getting the whole item, so the fiber would be included. That could be one way to increase fiber and therefore lower cholesterol to some degree, but that is not proven. Bea – We think your question warrants a blog post of its own. Stay tuned! Anyway a glass of sugarless juice can’t be bad for health. As for the myth that pineapple juice may help us lose weight, the same is said about grapefruit juice.